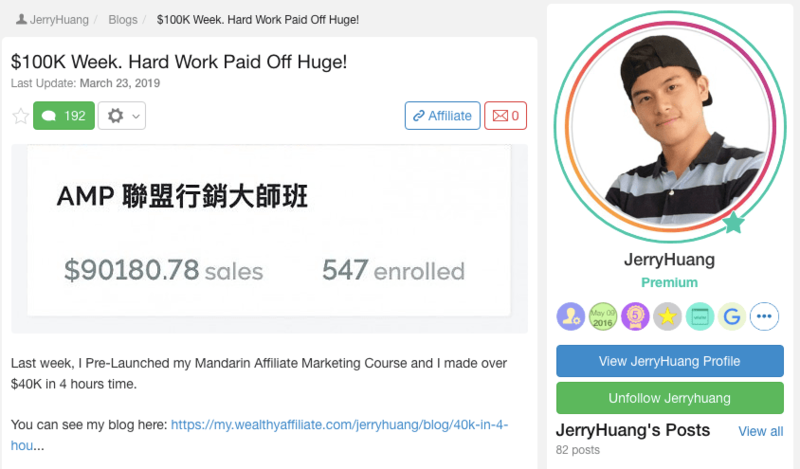 Wealthy Affiliate Review 2019: Easy Money Opportunity or Scam? In the spirit of full transparency, know that this Wealthy Affiliate review contains affiliate links. This means if you make a purchase through these links, I may receive a small commission at no extra cost to you. Click here to read my full disclosure policy. Imagine what if would be like if you were in control of your own schedule. Wouldn’t it be amazing if you could make money from the comfort of your own home… or anywhere in the world with an internet connection? You probably agree that if you want to be financially independent and retire early you need to find ways of making passive income. Well, creating an online business in a certain way can be a form of passive income for anyone. The best part is that you don’t need to have thousands of dollars to get started like many other forms of passive income. After you read this honest 2019 Wealthy Affiliate review, you will learn what Wealthy Affiliate can offer you. 1.3.1. Is Wealthy Affiliate a Scam. 1.3.2. Will I Have to Promote Wealthy Affiliate? 1.3.3. Will it Take Ages Before I Make Money? 1.3.4. Will I Have to Put in Tons of Time? 1.4. Why Use Wealthy Affiliate? 1.5. What are the Wealthy Affiliate Negatives? 2.1. What does Wealthy Affiliate do? 2.6. 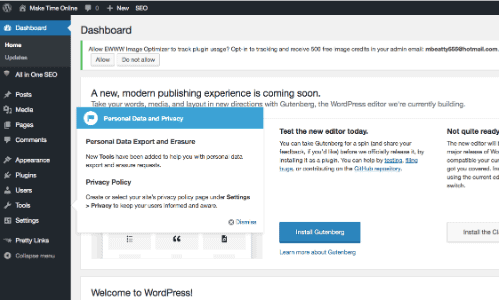 Managed WordPress Hosting- Set up Efficiently! 2.7. Why bother using the paid version? 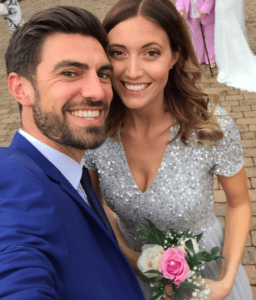 It all started on a sunny day in Essex, England, in August 2017. I had no idea how much those 7 words would shape my life. Read the “About Mike” page to learn more about this story. I didn’t even know blogging was still a thing in 2017! But after trying it out for a while and speaking to some people in this mysterious “blogging world” we realised some people were making a full-time income from it. And others were making way more than I’d ever be able to as a teacher. So it became a puzzle of mine to put the pieces together to figure out how they do this. As you read each word in this Wealthy Affiliate review you will see how it has helped me to put a lot of the pieces together. But I am not going to blow their trumpet to convince you to give it a go. I will be completely honest about my experience and show you the negatives so you can make an informed decision. There is so much proof, you don’t need to hear it from me. The 21-year-old college drop-out consistently makes 4 figures a month from Wealthy Affiliate. Do you notice the rate of growth in his income too? Oh, and did I mention he just made over $100k in a week from a new course he made? The little darling of Wealthy Affiliate knows how to get paid on tap. 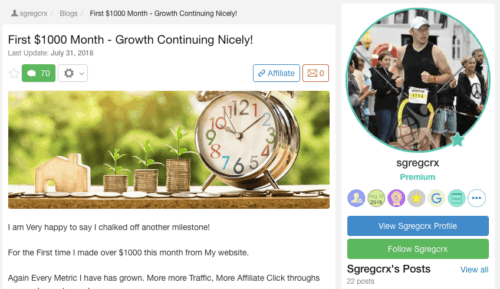 Are you beginning to notice the rate of growth after making the first affiliate sale? Will I Have to Promote Wealthy Affiliate? 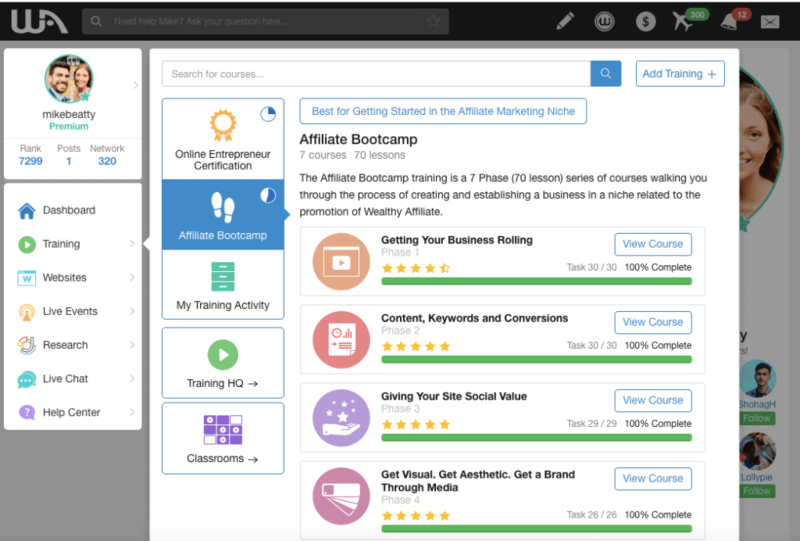 As you continue to read this Wealthy Affiliate review you will realise there are 2 training paths you can take. He makes money mainly from promoting other products on Amazon. Will it Take Ages Before I Make Money? 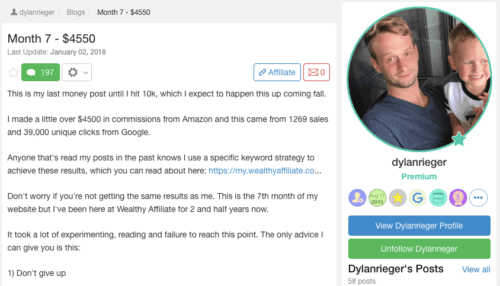 Dylan refined his tactics after working at Wealthy Affiliate for over a year. 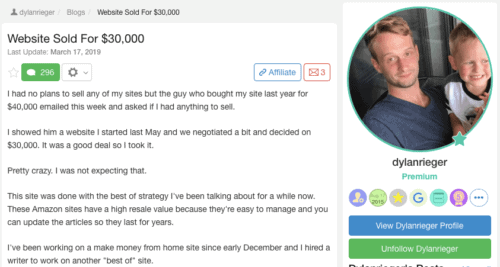 His new website generated over $4,000 in month 7! Will I Have to Put in Tons of Time? 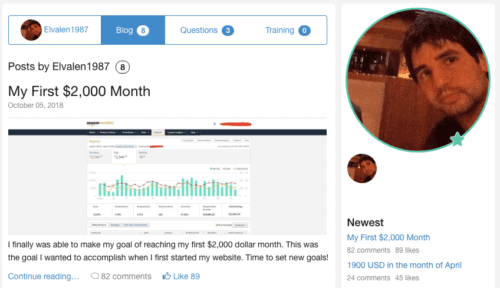 He is not a guy that has 40 hours a week to put into his online business… but he makes 4 figures a month! Now, if this is not enough proof click here to see a whole load more. Top Tip- Before you pay any money try the free account out. Find these people or thousands of others using Wealthy Affiliate and message them. They will tell you the truth about what they did and how much they worked. 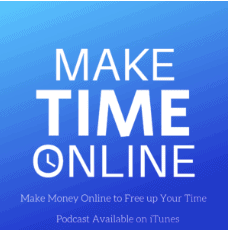 Making money online can be overwhelming. There are a lot of moving parts and everyone has the next best shiny object ready to distract you. As you keep reading this Wealthy Affiliate review, you will begin to realise Wealthy Affiliate keeps it simple stupid. Click on any of the above to read more about each step. What are the Wealthy Affiliate Negatives? Ok first of all I need to be fully open with you. Wealthy Affiliate is NOT for everyone. If you use Wealthy Affiliate it does not mean you will be successful and have money flowing into your bank account each month. It will show you what to do but you still need to put the work in. Some people do get frustrated with it and like to point the finger at the training program. There is a lot going on inside Wealthy Affiliate. If you’re not careful you will find yourself jumping around and trying to take on too much. The training exists for a reason. Trust it and follow it! “Build your email list immediately”. However, Wealthy Affiliate skims over this. It does have some webinars and some people have created training on it. There are over 1.5 million users on Wealthy Affiliate. Figuring out who to take tips from isn’t easy at the start, but that’s where I can come in to point you in the direction of the best people to ask! Disclaimer- Remember there is no magic button to press to make it all work. You will have to learn and put the time and effort in if you want to see results. To be honest it does so much that it can be overwhelming reading it all. 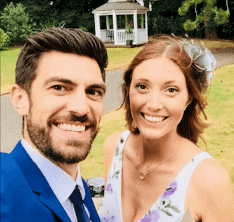 If you are interested in making money online to free up your time, then Wealthy Affiliate holds your hand into getting an online business up and running. When you try it out for free you will discover why so many people get excited and tell their friends about it . Basically, route 1 is for those who have a specific niche and know exactly what they want to do. Route 2 is for those who don’t really know and so they hold your hand down the make money online route. Now for me, the indecisive ninny here, I found this very hard to decide! Working in the education system since 2011 has shown me how little financial IQ is taught at schools. This website is my way to help spread the word about financial education and demonstrate different ways we can create more money (and hence time) in our own lives. …So route 2 it was! The Bootcamp is more useful than a cold beer on a hot day. It literally shows you, step by step, how to create your online business. The information is incredibly thorough. 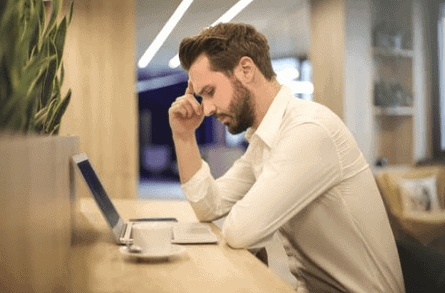 Do you remember reading that the downside to the training is the lack of depth in email marketing? Hindsight has taught me that it’s actually a good thing they don’t put this in too soon as this would cause overwhelm… I know this because I tried it anyway! Top Tip- Do EVERY step as it comes. Do not skip past action points and go at your own pace. 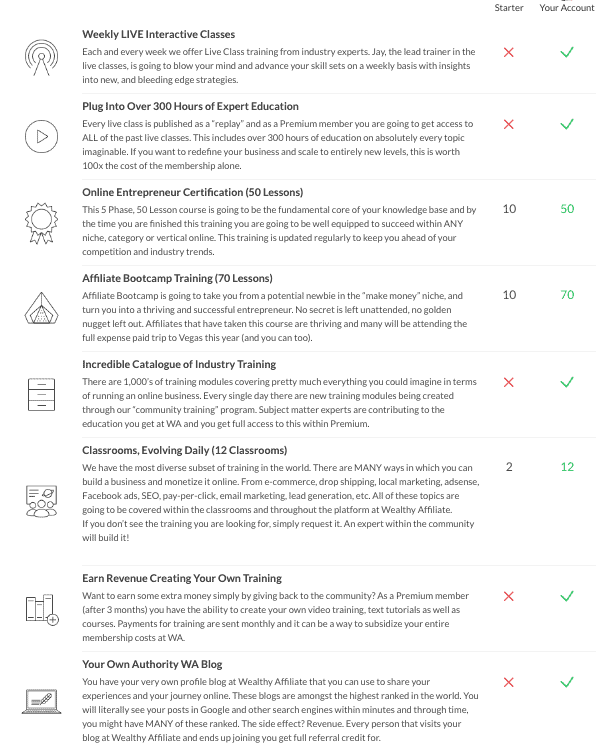 I decided to join Wealthy Affiliate after reading Riaz Shah’s website as I found his reviews to be very honest and informative. He has been more helpful to me than Robin is to Batman (…yes I just referred to myself as Batman!) Just look at the detail in his response to a question I asked. This is only a fraction of the answer… talk about personal service! There is also a Live chat and Forum so you can get quick responses to any question that pops up in your head! After only 2 months of being a member, I wrote a post about “Why do People Create Blogs“… 13 people inside WA took the time to answer some questions for me. People continually provide comments and feedback on my website and they are so helpful, generous and understanding of any type of problems. This was actually pretty amazing! I remember creating our website for our first blog on WordPress and I was so confused. WordPress is actually very user-friendly but it took me ages to make the website look how I wanted it. With Wealthy Affiliate, it took 30 seconds to create a website using Site Builder. No joke! Check out “How to Create a Website in 30-Seconds” for more info. The screenshot above shows all the things that come with the SiteRubrix Suite. I honestly have found it soooooooo helpful! For me, one of the best things about Wealthy Affiliate is the site comments. You choose what you’re interested in (so I never receive any baby advice or gardening websites) and you can skip websites if you’d rather not read it. So I actually find reading others people work really useful. All you do is write a meaningful comment to someone else. 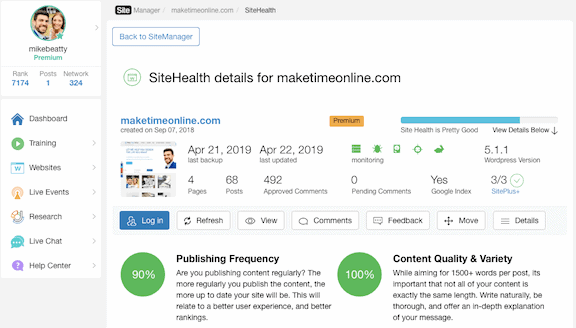 The Site Manager (above screenshot) is such a great way to see what you can do to improve your “Site Health”. It also shows the speed of your website and what you can do to improve this. This helps to ensure your website is optimised to improve its rankings on search engines and that your audience has a better experience when using the site. The Jaaxy Tool is an amazing way to find keywords that receive a lot of searches each month. If you want to learn more about SEO then check out this “Jaaxy Review” and particularly “How to Find Keywords For Your Website to Get Traffic on Tap“. As you absorb this information you will realise the best part of using Jaaxy is the QSR column (number of competing websites). This helps you to find keywords that have less competition. Therefore, your website will rank higher on search engines and you will get more visitors to your site… aka more eyes on your website to purchase through your affiliate links. follow the training, complete the tasks and all the pieces of the puzzle start coming together. This is actually worth $49 per month by itself but it comes as part of the Premium Wealthy Affiliate package. Managed WordPress Hosting- Set up Efficiently! Picture your website like a load of files on your computer. The “hosting” is basically where you store these files and share them with other people. People can pay anything from $60 to a few thousand dollars per year. So the Wealthy Affiliate hosting is top quality. If you are on the free membership you get 2 .siterubrix free websites so you can get started and try out the training without having to pay anything. Plus you can stay on the free membership for as long as you like! If you use the paid version you can get 25 free .siterubrix websites and 25 domains. 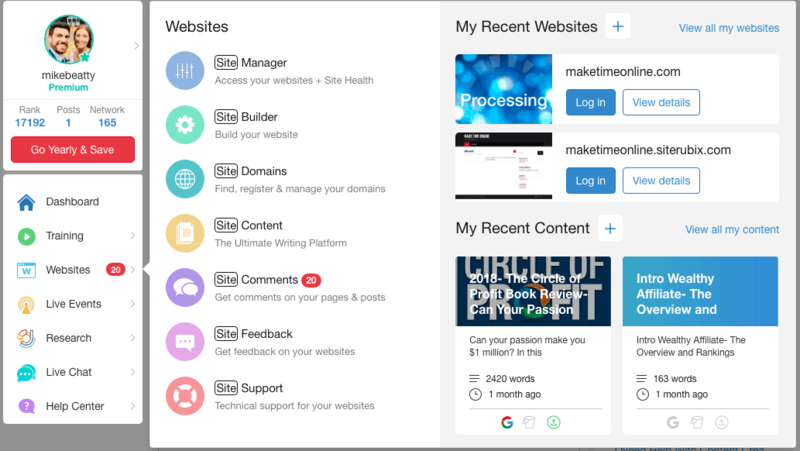 WordPress is what all the big online marketers use to manage their website and WA helps you get set up on there super easily. SiteSSL (notice my website is https instead of http. You usually find this on websites that you make payments on as it makes the site more secure). Why bother using the paid version? This is something that I asked myself a lot when I started out. You can access so many things on the free membership I didn’t really see the point. If you sign up right now you will be getting a free trip to Vegas every year for the rest of your life! !… Only joking!! Of course, they don’t actually sell this to you like that (that would be cool though eh?!) and of course, it’s great to set big goals but to get the all paid for Vegas-trip you need to get 300 people to sign up to Wealthy Affiliate. Remember, you DO NOT have to promote Wealthy Affiliate at all. If your passion is photography then Wealthy Affiliate can help you get a great online business set up for you too. The bit that is interesting for a lot of beginners is that you can get paid to refer others to join Wealthy Affiliate. Now, there are a lot of reviews that sell Wealthy Affiliate as the best thing since sliced bacon (I’m sure you’ll understand why in a second). So that means if 2 people sign up to Wealthy Affiliate from your link, you effectively get the premium Wealthy Affiliate membership for FREE! 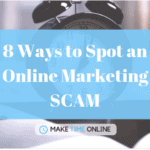 Are you beginning to see how people make money online? Wealthy Affiliate is amazeballs for beginners and bloggers that want to start monetising or scale their website. Especially if you are serious about making money online to free up your time, but still haven’t found the right strategy. Even if you don’t join the paid membership you can stay on the free membership for as long as you like and learn a load from the free training. 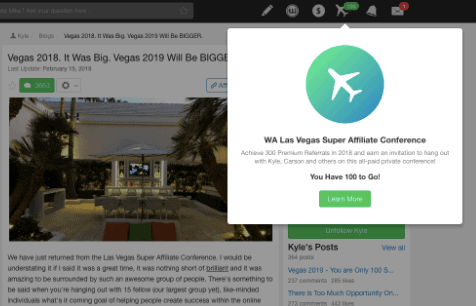 Have you noticed yet that if you want to connect with like minded people there is a strong active community on Wealthy Affiliate? Plus, I am already going through this process so you’ve already got someone to give you personal feedback and help. My Recommendation and Special BONUS!! I would recommend giving Wealthy Affiliate a try for free. This way you can check out the training, speak to some people who are in your shoes but a bit further on and make your own mind up. 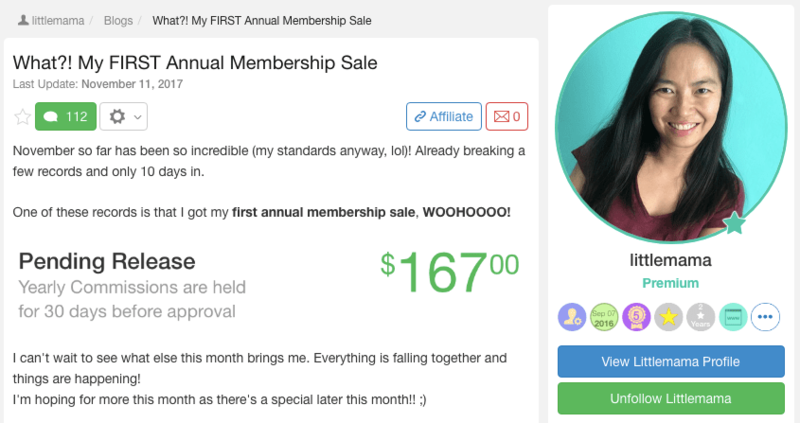 You get your first month for $19 (a 59% discount!) if you sign up in the first 7 days. You get personal and private access to me! If you have any questions starting out you can bet I had the same ones. 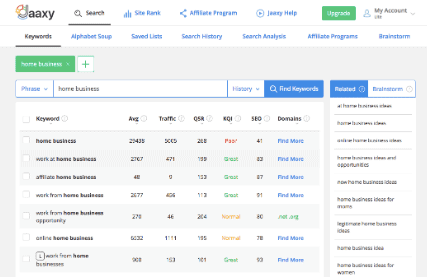 You get access to Jaaxy the Keyword Research Tool. This is so helpful at helping decide on a niche. This is worth $49 a month on its own, but it comes with the paid membership. Remember this is a special bonus for those “action takers” that join the paid version in the first 7 days. When you try the program out you will discover why so many people get excited about it and tell their friends about it. If you have any questions and I mean ANY questions about Wealthy Affiliate, please leave them below. If you have used or currently are a member please feel free to add your review below. The training also includes how to use social media including Facebook, Google+, Pinterest and how to make your website a place for others to engage. Thanks so much Laura, I really appreciated your comment on the community too. Those little things really do make a big difference to people starting. Good looking site Mike, like yourself i have just joined and trying to make it your site is well constructed and easy to navigate. Great to hear Dave!! I’ll check yours out now too. Great article. Very detailed and credit given to Anik as well. I agree Anik is a marketeer from a different league. This review for Wealthy Affiliate will help new members take an informed decision. Keep more such reviews coming! It’s definitely something I would like to try down the line though. Have you ever done any of his courses? Wonderful post. I like the way you explained your journey with wealthy affiliate. Honest review! Thank you so much! I hope it will be useful for others looking to start and I’m sure members can relate to parts. It’s my first time trying to start an online business, and I don’t use social media very often. Do you think that Wealthy Affiliate would still be a good way for me to get started? Hi Korbyn, thanks for your comment. I can honestly say that I went through a very similar feeling to you by the sounds of it so I can really relate. 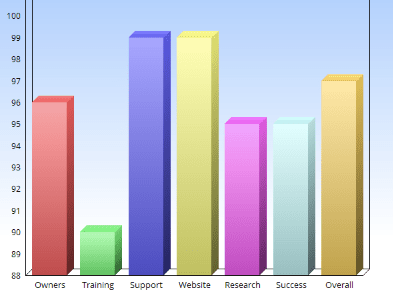 The best thing about Wealthy Affiliates is that it has got all the training you need. It even has training on how to use social media if you’d like to (but note you really don’t have to!! 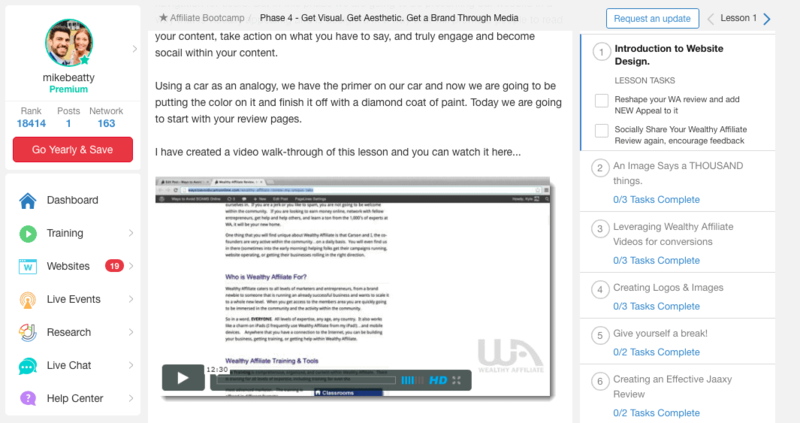 )- check the bottom of the post and I’ve added a screenshot of the overview of this training. It really is very thorough and if you don’t understand anything you can re-watch or ask the community. I have actually had answers to every question I have had so far and with the live chat, it can be within seconds. 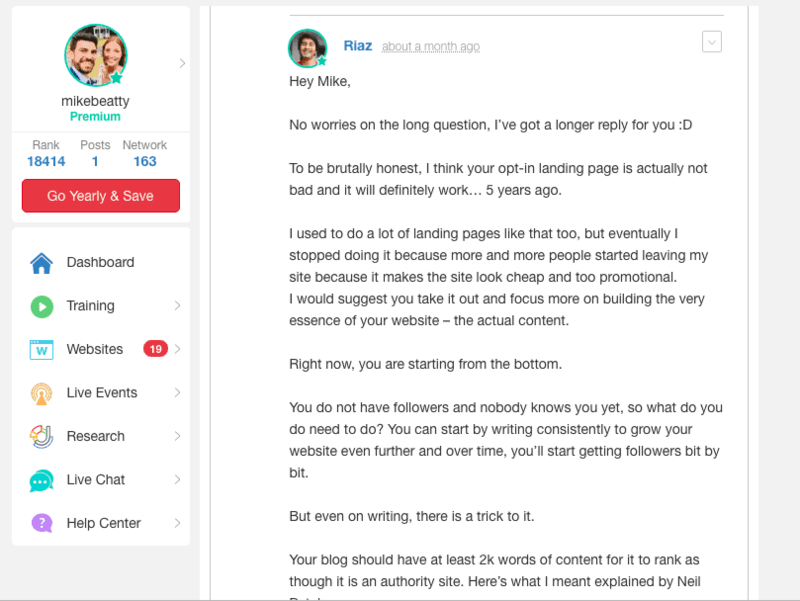 Interesting story and especially how you first started your blogging venture. I never started a blog to document my journey but this seems like a great idea. It will also motivate others to reach their dreams too. Your review was spot on as I am a member of Wealthy Affiliate and have no plans on leaving, EVER! Thanks Brandon, I really appreciate your comments! I figure it’ll be good to look back on one day if nothing else so I may as well just put the journey out there and see if it helps people. I know I’d love to follow someone else’s if they were in a similar position to me. That’s great that you use Wealthy Affiliates. How long have you been part of the community now? 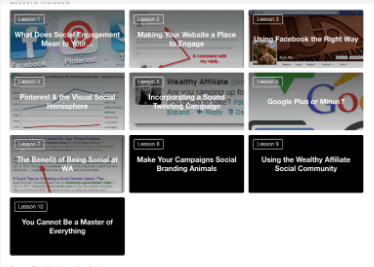 Very informative, it’s really a detailed post of Wealthy Affiliate. It provides a good guideline for everyone who wants to join. The price is not high too. It’s good for everyone who wants to start an online business. Start a blog and record everything about the life should be interesting. Thank you! Yes, I think it’s such a simple way to get started. There are such few costs upfront that it is easy for people to get started just by spending a few hours on it a week. Thanks for breaking it down so clearly!! I think Wealthy Affiliate is one of the best, it’s very good and I’ve been with them for 5 years. Their teaching is one of the best and is honest. 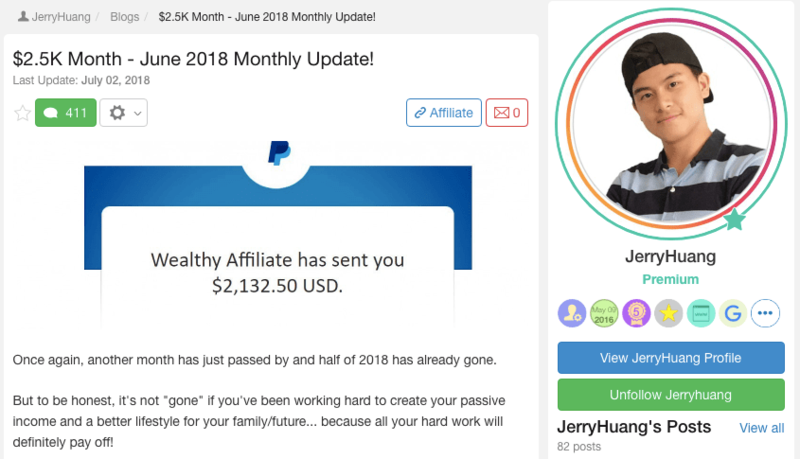 If anyone is worried about the cost, then don’t worry because when people sign up to Wealthy Affiliate through your site using your affiliate link you get commissions. In all the time I’ve been with Wealthy Affiliate, I paid for my first year hosting, but every other year has been paid for out of my commissions. They offer one of the teaching platforms of how to start a website, you won’t fail if you commit to it. Thanks so much for adding your own experience. It’s so great to hear stories from people such as yourself!! What is your niche/ can you leave a link to your website? I must say that this one great review about Wealthy Affiliate. I am member for a year now and I am more than satisfied. What I like the most is a great community and support which is priceless. Based on your experience, how long should it take to see some decent result? I’m glad your enjoying the program and the support is amazing you’re so right there! It’s a really hard question. Some people may only spend an hour a week on their website whereas some people will spend 100+ hours a week working on it. Just like with anything in life, the more time and effort you put into the more results you will see. There are some great blogs that I’ve read that have monthly income report. 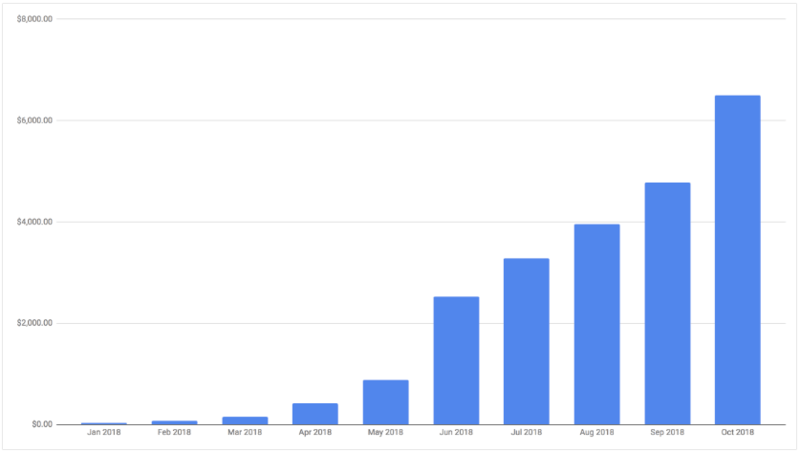 I saw one that started in 2011 and is now consistently earning more than $100,000 per month, so it really depends on how much time and energy you spend on it! Hi Mike!Well, we all love WA! What to say else? There are so many WA reviews written already! And many more could be written! Very simple, WA has it all! All in terms of building up your sites, creativity, skills and knowledge in the world of online marketing, engagement, great support, stability, past and fresh content, thousands of tutorials, community ready to help in no time, and much more.If you don’t join and don’t start using the tools, platforms, lessons, training and more, you will never be able to discover this opportunity.Great reviews can only help to anyone to understand the value offered. WA unites all you need to work online, There are thousands programs out there you can join. I have studied hundreds of them. Everyone is explaining the same thing in own way, with few more or less tricks here and there.What I have learned so far, through WA and my own experience while researching online and through my failures and my occasional attempts, not massive once, to be honest, what is completely wrong of course, is I guess what many people around the world are experiencing in the same, way at least those in a similar position as I am now! But, regardless all said above, the main principle and system to make money online, and to improve your skills remains. It is a basic system everyone needs to go through. This is the basic, the fundament. Surely, you need to develop each step, but you need to go through these steps. So, WA, Anik Singal or any other marketer, they have done their lessons and tasks. That is why they succeeded! They took focused and determined ACTION! This is what it comes to at the end! 1) What? 2) WHY? 3) How? 4) When?5) Where?6) WITH HOME?7) ACTION! MASSIVE ACTION! WA offers answers to all of that! And yes, it is a circle. I call WA as “all round editing and learning circle!”. But, taking action is most important. For example, there are so many wonderful book authors with unknown great books because they didn’t take massive promotional actions. You mentioned the words with capital letters in the list above? In my opinion these are the most important questions to be answered (although all others are very important as well). To know why am I doing this, do I do it with the right people and do I really do all is needed and take massive proper action? We all who are not yet that successful, need to take action to become successful online. This is the fact! Answering each of those questions and to take proper action on each of it, it is simple … no success!Maybe now, it is also our turn, to learn from them and possibly succeed. The time will show!Thanks for your post! I would like to hear from you your opinion about my comment!Thanks in advance.Best regards!Stay well, market better, convert best! You are spot on!! What a super comment. WA really does have it all in one place. All the information we can possibly need is all there on their website. The community is amazing and any new updates or changes to anything comes in straight away. If someone was able to absorb all the information from this website and use it (as you say take massive ACTION) then everything to do with an online business would be there! All good marketers will do these 4 steps and improve on them. What is the one common mistake you notice from people starting out online? Thanks again for your awesome comment! Holy Cow, what a review. 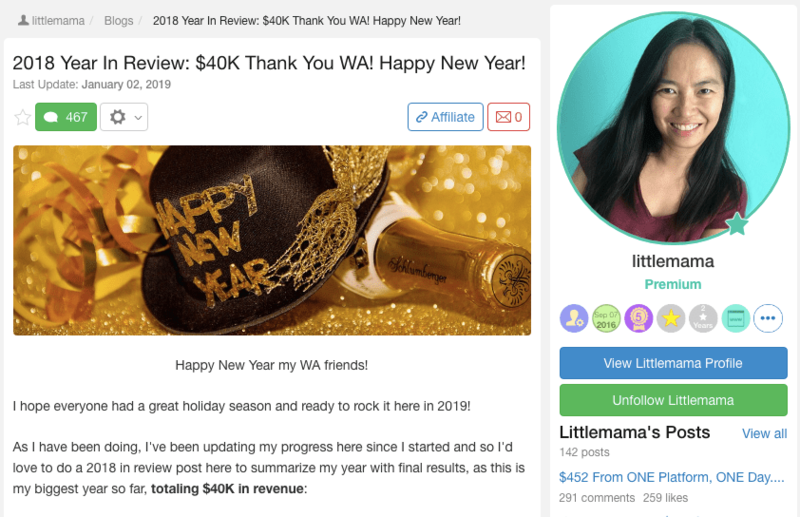 I love the layout and feel of this review for Wealthy Affiliate. I found information and screenshots that explain more in depth the kind of tools and value this program has and the price is more than fair. Other programs like it cost $97 a month or more or as in the case of Click Funnels and Clickbank Academy can add up to thousands of dollars quickly with the upsells etc.. needed to get full training. I like the fact Wealthy affiliate has no upsells, you just have an option of how much you choose to pay for premium by choosing legth of time between payments. It really is incredible value for money. The more programs I see and compare this too the more I realise what value is in the program. I genuinely was very sceptical about the program when I first joined but the more I use it the more I realise how if you follow the training step-by-step, you cannot go too far wrong!